Hips: If you had to choose, what is your most favorite piece of music you’ve written? 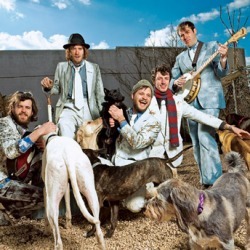 Dr. Dog: Awwwwww man. Do i have to choose?! My oldest song is a successful family man and my youngest boy is making some real waves in the halls of the ivory tower. We all have a sense of favoritism but in some cases that is just plain old evil. Hips: What is your favorite piece of music someone else has wrote? Dr. Dog: At the moment "Sawdust and Diamonds" by Joanna Newsom. In the past "You Were Always On My Mind" by Willy Nelson. In the future, "I Am A Computer Man" by Scott Mcmicken. Dr. Dog: Dr. dog studio is like a kids dream. A fort that is only missing one thing: a half pipe. I really like the night time and a piano seems to have an overwhelming effect on my time. When it comes down to it any place that i can justify calling home becomes so comfortable that i can forget all the things I need to forget in order to be productive. Those places are, sadly, Few and far between. Hips: Both lyrically and musically, how do you think your music compares to your earlier work? Dr. Dog: From where i stand the old days and the new are virtually identical. Lyrically I'm still trying to say the same thing I've always tried to say and musically I seem to want things to become more and more simple, ever after. The more obvious variations in our music have alot to do with what ever contraption happens to present itself at any given moment, be it polaroid or head cleaner. Hips: Describe a time you heard your music played in an unexpected place (store/restaurant/movie/etc)? Dr. Dog: The time: described as often. the place: never ever expected. the point: hearing yourself in foreign settings (meaning public domain) feels a lot like walking around with food on your teeth and not realizing it. Hips: What period of time, album, or maybe even just song do you think you’ve made that turned out to be most personal? Why do you think that is? Dr. Dog: By virtue of the fact that i once wrote a song about and for a person that I immediately knew should not be heard by the very subject of the song makes me think that on that one i got dangerously personal. That song is called 'I Hope There's Love"
Hips: When was the last time you wrote a song? Can you describe the situation? Dr. Dog: I'm working on a song at the moment called "Environmentally Friendly Saturn". My hope with this one is that it completely changes reality as we know it........ just kidding. On the road its hard to find a place to consider home therefore its hard to write.. before I split for tour I found a song in my living room hidden in a purple piano. As of late the songs seems sort of unrecognizable, I'm sure this has a lot to do with factors entirely unmusical. to be more direct the last song i wrote was my first ever song of hate. It's about smoking cigarettes and in it I feel like i succeeded in making my relationship with smoking loving enough to consider giving it up. Hips: What artists and albums have you been listening to lately? What do you like about them? Dr. Dog: The Teeth. Thats about it and Joanna Newsom. And as with most things i like i have absolutely no idea what it is that makes it appealing. In general i have observed that the things i have found to be of quality display a certain amount of commitment.. a built in permanence. Responsibility. Was it Madonna or Jim James who said "you must express yourself?" I can't remember. The proof and the pudding. What seems to matter most is whether or not a person actually enjoys what it is they choose to make. thanks for the interview! hile sitting on Myspace I pressed the refresh button one last time before signing out. I was somewhat apathetic and somewhat pleased to see this simple action yielded a “New Friend Request” notification. Oh great, I thought, another lousy band wanting to be my friend. I was half right. Ken Stringfellow, former frontman of the Posies, and his newly acquired music profile was asking to be my friend. Not so lousy after all. I clicked “Approve” and went about my day only to later realize our new budding friendship (not really) would provide a great opportunity to snag an interview. We originally had intentions for a phone questionnaire, but he ended up touring outside the US so I shot some messages his way via his Myspace (i.e. the only place our friendship existed) to avoid calling cards and long distances charges. Hips: If you had to choose, what is your favorite piece of music you've written? KS: Well, I dunno. That changes. I guess I am thinking more about what the future could hold. I am proud of my work thus far. I'm not sure I have a 'favorite'. Hips: What is your favorite piece of music someone else has written? KS: I've been enjoying working on my computer at home. When I can step away every hour or so and do something else, I get a nice charge and find I can actually get a lot done. Frequent breaks are good for you! But, increasing productivity is not my goal these days... if anything, it's about getting more time off. Hips: Both lyrically and musically, how do you think your more recent music compares to your earlier work/ work with The Posies? KS: I think the lyrics are better. I think I have gotten more sophisticated and more confident. And more diverse. Hips: What period of time, album, or maybe even just song do you think you've made that turned out to be most personal? Why do you think that is? KS: I blur the facts with a little bit of fiction, always, to make it less about me and more about we as humans. Although I think This Sounds Like Goodbye, my first solo LP from 1997 was the raw result of very raw feelings. KS: I have been rehearsing with the Disciplines, my band in Oslo, this was last month, and we wrote a few songs in the course of a week together. Bjorn, the guitarist, brings in fairly complete songs and I help with lyrics and arrangement ideas. We get together every couple of months and we usually only have a week, so we work hard and try and walk out of the place with results each time. So far, so good. KS: Marvin Gaye—do I have to explain? Producto, a band I was working with from Athens GA, who make very diverse, intense and beautiful music; when I am working with a band it's kind of all I have time to listen to though. Hips: It's been a few years since your last album. What can you tell us about your most recent musical ventures? KS: Only 2 years! I'm still touring for Soft Commands, which came out in 2004. I have shows this fall in the US and Europe. This year I have been continuing to tour with The Posies and doing shows with Big Star, relevant to their respective 2005 releases Every Kind of Light and In Space. Both bands just played festivals this last weekend in Spain. I have been producing a lot of artists, and writing with The Disciplines. Plus doing sessions for other artists as a musician, and making music with the ever entertaining White Flag. Hips: Can you name any musical acts/albums/songs that have caught your ear lately? Hips: What does the process of writing a song look like for you? KS: It can look like many things, but, to be honest, I generally pick a time to disappear and sit at the piano/guitar/computer and see what comes out. I might have a few tiny pieces of music, chords, melodies, whatever that have been discovered at idle moments in the studio working for other people, or at home, or in a hotel room...but I usually have to be alone somewhere and work out the details. Usually when I go on these kinds of retreats I work out a few things from scratch as well. I last went in spring to a little farmhouse in Burgundy and came out with 4-5 new songs. KS: That's for Ken Stringfellow, the solo artist. But, for my new band the Disciplines, it's totally different. Bjorn, our guitar player, writes song ideas that are more or less complete. He brings them to rehearsal (we rehearse every now and then—we got together last month, e.g.) and I edit and rewrite, sometimes radically. Hips: How would you describe your music to someone who has never heard it? KS: I wouldn't presume they were interested...I probably wouldn't...it's always awkward to do so. Hips: When did you first begin playing music? First bands? KS: I started to have piano lessons when I was 9 or 10; I was awful. I picked up guitar on my own when I was 12, and formed a band with my school friends. We played a few shows—bake sales and school dances and the like! But, thru this band I met Jon Auer when I was 14. We have been playing music ever since—so that's almost 25 years. The Posies are celebrating their 20th anniversary next year, in fact. Hips: Do you prefer playing live or just writing music/jamming? Hips: If someone were to ask you one thing you would die for, what would be the first thing that comes to mind? KS: my family, of course. Hips: Are there any common themes in your latest work in regards to both the 'sound' and the lyrics? KS: The Disciplines are easily distinguished by brevity, energy, accessibility, singability...the KS stuff is more about frustration, disappointment, doubt...and all the KS stuff I am doing is being recorded on my laptop...I work under those limitations at home. Hips: What is the weirdest thing a fan has ever said/done? KS: You mean, to me? Nothing tremendously weird. Although one of them told me she formed a band and got me to work with them just to get my, uh, attention. If that's actually true...it's kind of weird. Hips: Who has proven to be the best/most fun band to perform/tour with? The worst? KS: Well, any band with me in it is going to be fun! I love touring and playing. REM has been amazing, as they have opportunities that are really incredible—and they're a great organization and a band with a great musical legacy. As far as worst goes, I think the Posies tour supporting the Longpigs in the UK was a true low point. The Longpigs were a typical big-for-10-seconds British band with big-for-10-seconds-fans, and our entire backstage rider consisted of three cucumber sandwiches...for four musicians. Hmmm. We actually just didn't show up one day and told our bus driver to drive us to Heathrow, and we fled in disgust. Hips: If you could pick any song/album ever recorded, and get credit for writing it, what would that be? KS: Well, easily that would be the Saturday Night Fever Soundtrack. Not only do I love the BeeGees songs, but...I'd have been able to retire at age 10.